Companion Animal Diagnostic Market size was valued over USD 1,871.1 million in 2017 and is expected to witness more than 7.9% CAGR from 2018 to 2024. Growing trend of adopting pet animals across the globe in the last few years will drive the companion animal diagnostics market over the forecast timeframe. Growing pet adoption along with rising disposable income spent considerably on pet care will positively impact market growth. According to European Pet Food Industry Statistics, there were around 75 million pet owning homes in Europe in the year 2014. Thus, increasing adoption of pets leads accelerates demand for advanced pet products thereby fuelling market growth. Dogs and cats have been a major source of human infections by zoonotic pathogens such as bacteria, fungi and parasites. There have been numerous efforts undertaken by domestic governments and various organizations to reduce prevalence of animal derived human infection. Around 320,000 people in Euhost-rope suffer from food borne zoonotic disease every year as per European Food Safety Authority. The increasing prevalence of food borne, and zoonotic diseases has stimulated demand for advanced animal diagnostic solutions thereby propelling industry growth. High cost that are associated with animal tests hampers companion animal diagnostics market growth. Some animal tests require months or years to analyse and conduct, and all this occurs at the cost of hundreds of thousands or millions of dollars per substance examination. Hence, high cost and more time taken to diagnose and analyse will lead to decline in business growth. Clinical biochemistry animal diagnostic market garnered over USD 553.3 million in the year 2017. Clinical biochemistry has evolved as one of the major diagnostic field in veterinary medicine and animal science. Clinical veterinarians and scientists use most of the diagnostic and therapeutic tools on routine basis to identify and treat diseases including metabolic disorders. Furthermore, growing demand for veterinary care with high economic value and efforts to conserve endangered species will drive industry growth. Introduction of micro methods in clinical laboratories and public demand for advanced veterinary care will further drive industry growth. 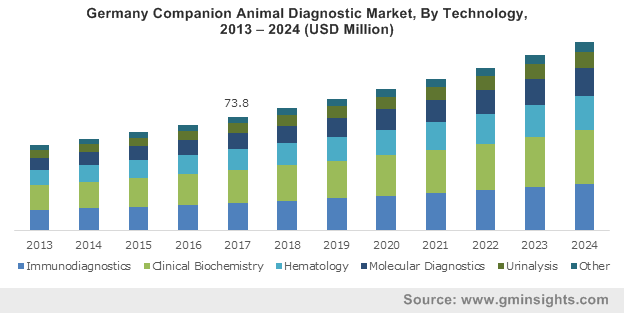 Molecular diagnostic companion animal diagnostic market will witness robust growth at a CAGR of 8.4% over the forecast timeframe. Veterinary molecular diagnostics focuses on the detection, identification, and genotyping of pathogens. Due to increased monitoring and testing of animals, demand for fast and reliable diagnostic techniques are high. Molecular techniques are extensively used in veterinary and livestock research for vaccine development, research on resistome analyses, host-pathogen interactions and microbiome will drive the segment growth. Cat diagnostic market generated considerable amount of revenue in the year 2017, accounting for around USD 653.5 million. Urine analysis screening test is useful diagnostic screening test for diseases in cats. There are numerous ways to accumulate urine sample from companion animals. Small amount of urine can help describe kidney function and also looks for evidence of urinary tract infection, urinary crystals, or diabetes. Dog diagnostic market will show substantial amount at a CAGR of 8.0% over the forecast period. Availability of affordable, fast DNA testing for inherited diseases in dogs and partnership with scientists to validate, develop, and deliver more testing option for pet owners and breeders are factors propelling business growth. Also, growing trend of pet adoption and humanization, increasing urbanization and rising affluence in emerging economies propels industry growth. U.S. companion animal diagnostic market was valued over USD 1,247.2 million in the year 2017. Increasing disposable income significantly spent on pet care, technological advancements in veterinary diagnostics and growing pet adoption will drive U.S. companion animal diagnostics market. U.S. has one of the largest pet populations, consisting of companion animals such as dogs and cats. Dog population in U.S is around 69,929,000 while cat population is about 74,059,000. Hence, these factors will play significant role in augmenting the regional market growth. India companion animal diagnostic market is projected to witness growth at a CAGR of 12.7% over the forecast period. Growing awareness about animal health and prevalence of zoonotic diseases and food borne diseases are predominant factors increasing demand of companion animal diagnosis products. Additionally, various initiatives to prevent development of zoonotic diseases through animal vaccination programs is intensifying the use of medicated feed additives for producing high volumes of healthy animals as well as in general healthcare practices. 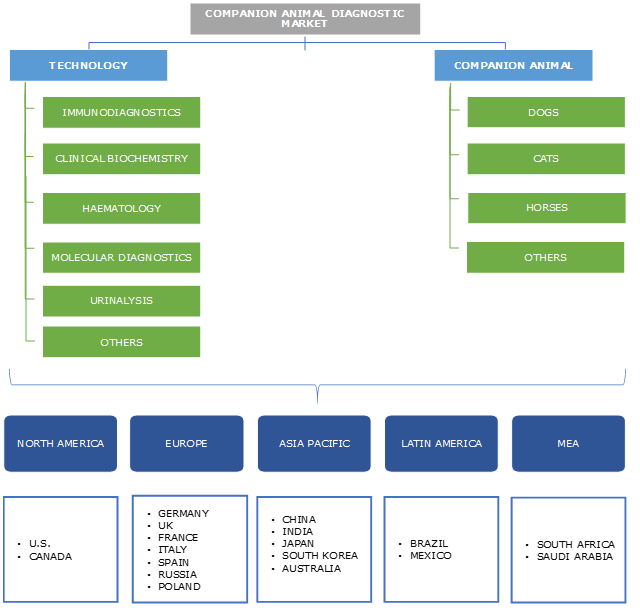 Some of the leading players in the companion animal diagnostic market include Abaxis, Heska Corporation, Randox, Virbac, Qiagen, IDEXX Laboratories,Thermo Fisher Scientific, Neogen, Zoetis. These companies mainly focus on strategic decisions such as research and development investment in order to develop superior veterinary diagnostic solutions. Also, new product launches in developed geographical regions will enhance the growth of the companies. In February 2018, Zoetis introduced a new diagnostic device named Carysta HVC. This instrument is designed for performing high volume diagnostic test to advance productivity as well as reduce cost. Currently, the increasing use of diagnostics and monitoring of infectious and chronic diseases in the animals is mainly based on the detection of antibody to the pathogen of interest. There has been increasing trend in adoption of pet animals across many nations. Companion animals (dogs, cats, and horses) play an important part in the lives of people and the global market for companion animal health products is estimated to grow and be more specialized in the forthcoming years. Growing and strengthening of bond between owners and their pets or companion animals, increasing owner awareness, and increasing owner demands and for companion animal care. With growing urbanization, there will be shift in the species and type of companion animals kept, while growth in the care of these species is expected, this will of course be influenced by economic, social, and demographic trends.